We’re back with our month-long Mass Effect challenge! For previous days, click here. Mass Effect Month, Day 19: Who is the best antagonist of the series? I suppose the somewhat obvious answer is the Reapers, since not only are they VI thinking they are AI, and not only are they giant crawfish/squidlike robots that sleep for 50,000 in order to destroy organic life so organic life isn’t destroyed by robots, but they are also the reason, well, everything happens in the original trilogy. So I suppose we should be a little grateful to the Reapers, because they’re the reason we got to meet Shepard and friends. Oh, you actually wanted a real answer, didn’t you? That really leaves The Illusive Man and Saren in the running, doesn’t it? One of the most fascinating things about those two characters is that neither one of them is really Evil with a capital E, but neither were perfect angels, either. Saren was a Spectre, accustomed to working outside the law, with deadly force as needed, and – I presume – not suffering any consequences as he worked directly for the Council. However, he was, presumably, a friendly face to Nihlus, our turian Spectre friend at the beginning of Mass Effect, and to another turian you can meet in Mass Effect: Andromeda, who talks about him as a pretty upstanding guy. The Illusive Man committed the sin of being rich and entitled, heading an organization that housed pro-human extremists but also harmless scientists like poor Kelly Chambers, or incredibly intelligent scientists like Miranda Lawson. Or Jacob Taylor, who’s a cool guy, I suppose. But something happens and they become villainous. They are both indoctrinated by the Reapers. Suddenly, Saren wants to bring the entire galaxy into the Reaper collective, and The Illusive Man wants to exert control over the sentient robots himself. And thus we are led to believe that these guys are the “bad guys,” as complex and interesting as they are. Who would Saren be if not for the Reapers? Probably a Spectre working alongside Shepard. Where would The Illusive Man be if not for the Reapers? Hiding away in his base somewhere, funding whatever projects struck his fancy. So… yeah. I’m going to with the Reapers being the best baddie of the series. Without them, none of the “villains” I love would have ever floated to the surface. I’m doing it again, aren’t I? Poor Mass Effect: Andromeda just hasn’t entered my brain’s Mass Effect encyclopedia as strongly as the trilogy. However, having said that, the idea of a creature wanting/needing to destroy other races for its own survival and basically creating a culture or religion around that was fascinating. 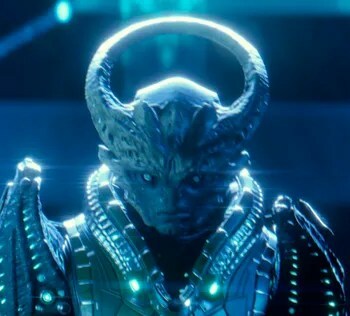 I especially liked the inclusion of the Archon, who caused a ruckus amongst his own people because his focus shifted away from the kett mission and onto his own interest in the Milky Way galaxy species and Meridian. Here’s a guy who not only cause chaos for his enemy, but also for his “friends,” and those types of villains are very interesting when they are let loose in a story. Hopefully we’ll see him again in another game, and bring some closure to the arc Mass Effect: Andromeda started. Who is your favorite villain from the series? It had to be the Reapers right? 🙂 I remember first meeting Sovereign in the original Mass Effect – one of the best ‘baddie reveals all his evil plans’ moments I can think of from any media franchise ever! Sovereign was a great villain, and I loved how he was almost like a Bond villain in that sense haha. 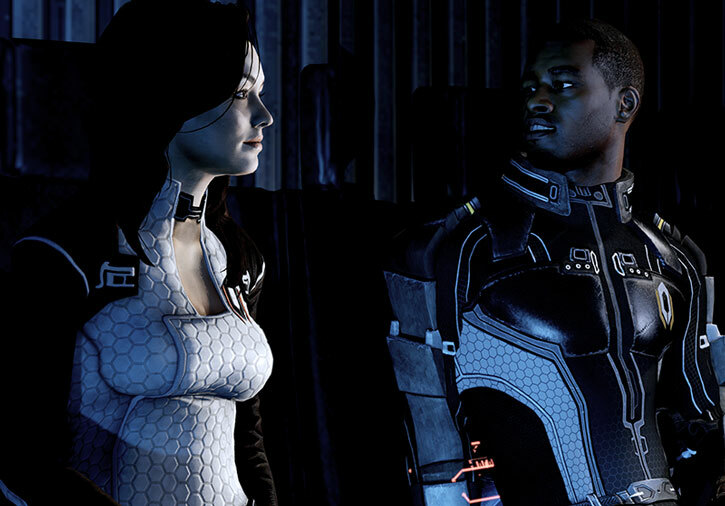 Although I also have a little spot in my heart for Harbinger because he was just a perpetual thorn in Shepard’s side. Sovereign was such an epic reveal. I am thinking back to how terrified I was. I had the game running on some loud big speakers, and his voice shook the room. Talk about making an entrance. It definitely was! That voice, wow. Harbinger is great and all, but his voice has *nothing* on Sovereign. In terms of personality, Morinth is the best villain. It’s such a shame she is sold short if she survives ME2. She’s definitely an interesting character. I liked how she has this attachment to her family, specifically her sister, so much that she lies about Samara’s death either so a) they don’t hate her more or b) they at least find peace that Samara died fighting for justice (which she did). Her banshee arc is sort of unexpected, but I did think that was an interesting (and sort of sad) twist. Yep. Definitely the Reapers. Harbinger really struck a chord with me. I got a little panicky every time I heard “Assuming direct control” while fighting creepy stuff, not gonna lie… I really liked Saren too. The first Mass Effect game is spent chasing him and it felt satisfying to finally put him down after an epic fight.